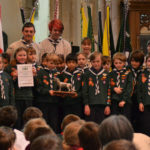 Scouts, cubs and beavers from the District enjoyed a lovely day for this year’s St George’s Day parade and service – filling St Nicholas’ church to overflowing. 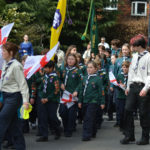 The theme of the service was the importance of communication to scouting and everyday lives, with all groups taking part. Freddie Willson was joint winner of the Best Explorer in District for all his efforts with Beavers, Cubs and Seal Scouts and now Otford and his help with our Ground Maintenance. 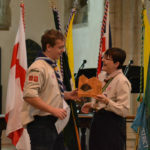 Our Beaver colony and Scout Troop were also commended for their respective trophies. Paul Davis (GSL) was awarded is 15 year service award and John Talbot (ex GSL) his 40! 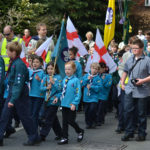 Congratulations to the whole Group and to the 9 Beavers, 15 Cubs and 17 Scouts that paraded on Sunday in particular.